Play an incredibly valuable part in shaping the lives of future generations. Working in Early Years & Childcare is a career you can be proud of. If you are responsible, reliable and have bucket loads of enthusiasm, on top of a caring nature and of course enjoy working with children, this could be the perfect career for you. There will be the opportunity to train and gain qualifications whilst you are working and earning too. From Apprenticeships to Nursery Managers, there are various routes into Early Years and Childcare, depending on your qualifications and experience. As part of the recruitment process and before you can start working with children you need to have Disclosure and Barring Service (DBS) checks to establish your suitability to work with children. Apprenticeships offer paid work with training to earn while you learn. Apprenticeships in Childcare can take between 12 months to four years and are available at intermediate, advanced and higher (degree) level. Nursery assistants tend to work in the same settings as Nursery Nurses in a less senior role. They are often members of staff who are relatively inexperienced or who hold a low level of qualification. They are likely to be training for a Level 2 qualification and will be well supervised. Pre-School Assistants are employed in the same settings as Pre-School Leaders in a less senior role. Most employers will prefer assistants to hold a qualification or undertake training at Level 2. 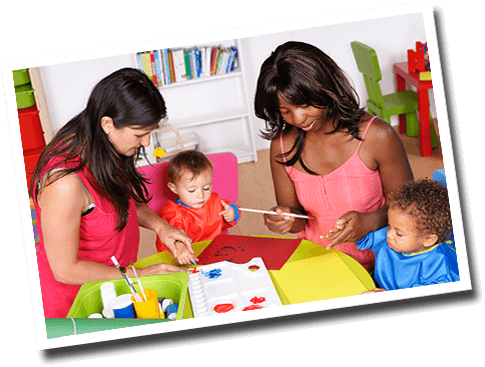 Many parents begin a career in childcare as Pre-School Assistants working at their local playgroup. Playwork Assistants support the Playwork Leader in their work. Most of their job is face to face work with the children. Playwork Assistants will hold, or be encouraged to work towards, a Level 2 qualification. Crèche Workers are employed in a variety of settings with attached crèches, e.g. sports centres and supermarkets. Many crèches prefer workers who hold qualifications. Crèche Workers take care of children from across the age range. Nursery nurses are qualified members of staff, usually holding a Level 3 qualification. They are normally responsible for the care, education and all round development of the children. They work in a variety of settings including local authority nursery schools and private day nurseries. The Deputy Nursery Manager would be expected to run the nursery in the absence of the Nursery Manager and need experience in supervising staff. A comprehensive knowledge of childcare and early education issues is also essential, as well as a Level 3 qualification. Nursery Managers have been qualified for at least two years and have managerial experience. To run the nursery on a day-to-day basis they need good administrative and communication skills plus team leadership abilities and a comprehensive knowledge of childcare and early education issues. Pre-School Leaders are employed in pre-school or playgroup. The emphasis is on learning through play and parental involvement in all aspects of the playgroup is encouraged. Pre-School Leaders will have a Level 3 qualification and will have suitable experience of working with children. Playwork Leaders work in a range of settings including hospitals, community centres, after school clubs, holiday play schemes and junior youth clubs. They normally work with children aged 5-15. The Playwork Leader manages the provision on-site and provides a range of safe and developmental play opportunities suitable to the age range. Childminders usually look after other people’s children in the Childminder’s home. They are self-employed and take care of a limited number of children. Childminders must complete a Childminders Introductory Course and hold a suitable first aid qualification before registering with Ofsted. Nannies care for children in their own home. In some cases the family prefer the nanny to live-in. Agencies generally prefer nannies to hold relevant qualifications at Level 2 or above. There is no registration requirement for nannies at the moment but they could choose to register on Ofsted’s voluntary register. Training and professional development opportunities are available to anyone working or aiming to work within Early Years and Childcare.